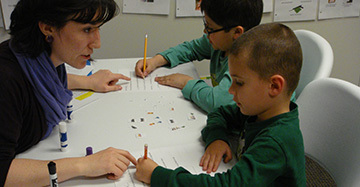 CLSD has partnerships with charter, private, and therapeutic day schools throughout Chicagoland. We can provide expert speech-language pathology services to meet the needs of your team and your compliance standards. In addition to related service speech-language and related service providers, we have expert staff who can act as Literacy Interventionists/Response to Intervention Consultants and Providers. We can provide long-term services, in addition to short-term coverage, e.g. for maternity or disability leaves. Community partnerships allow us to further our mission by helping more clients and students reach their full communication potential and providing education to families and professionals in the community. We would enjoy tailoring a program to meet your needs, collaborating with your multi-disciplinary team, and helping students thrive. If you are an administrator looking for services, we can help! Call Karine Faden Fiore, Executive Director or email [email protected] and take your speech-language program to the next level! Our expert team will surely be an asset to mission.